Whether you receive professional care for your skin or you’ve never seen the inside of a dermatologist’s office, you probably have a skin care routine that you stick to through and through. However, if you continue to struggle with blackheads, scarring, or dull skin even after performing your elaborate skin care rituals, it might be time to take your concerns to the professionals. Consider trying one of the unique facials below. If you have fine lines, wrinkles, blemishes, oily skin, dry skin, or sunspots on your face, then this facial may be for you. It’s a non-invasive and painless treatment that uses nanotechnology to penetrate beneath the skin’s surface with nutrients that target your skin’s specific needs. Rather than treating your skin with surface layer products, this precise technology effectively rejuvenates your face on a cellular level. 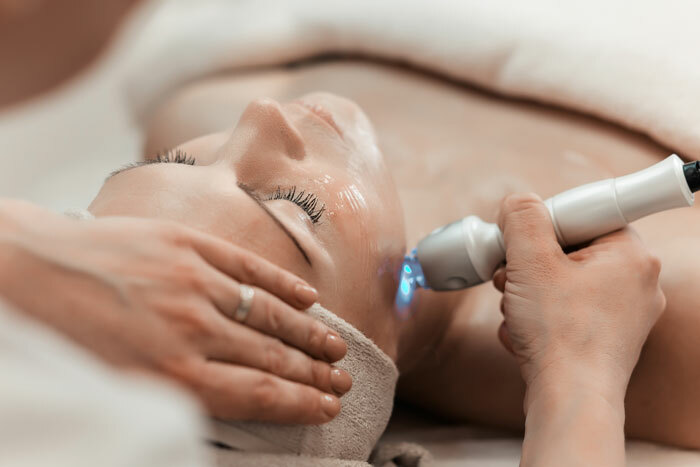 This two-in-one facial is based on the idea that skin problems are deeply rooted and embraces the idea of channeling your mind, body, and spirit to connect and listen to your skin’s needs. A skin coach helps you detect stressors in your life that may be behind your skin concerns. One intuitive facial brand, Therapeutic Skin Coach, even has a series of cleansing meditations you can download. Like the name suggests, this facial involves both hot and cold treatments, and the results are instantaneous. Designed for all skin types, the fire and ice facial is an exfoliating treatment made up of botanical acids, retinol, antioxidants, and niacinamide. It’s followed by an aloe vera, rosemary extract, green tea extract, and hyaluronic acid-infused mask, which smoothes wrinkles and fine lines, softens and rejuvenates skin, and leaves you with a radiant complexion. Cosmetic acupuncture is commonly used as an anti-aging facial because it boosts collagen and reduces the appearance of fine lines. It’s corrective and preventative, making it a suitable treatment for any skin type. Unlike most facials, acupuncture doesn’t involve any extractions, steaming, or masks. Instead, the needles open your skin channels and release the tension and stress that cause wrinkles, dullness, and aging. Have you tried any of these facials? Share your experiences in the comments below!